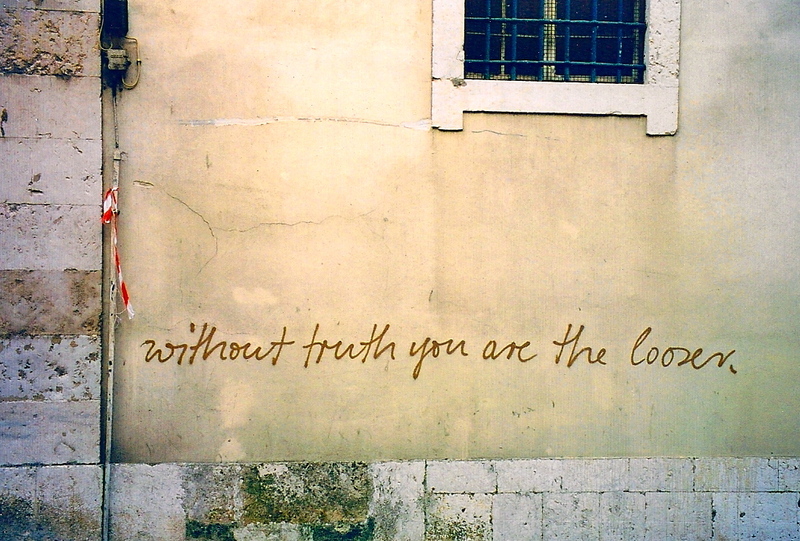 Loose truth tends to loosen my bowels, for sure. 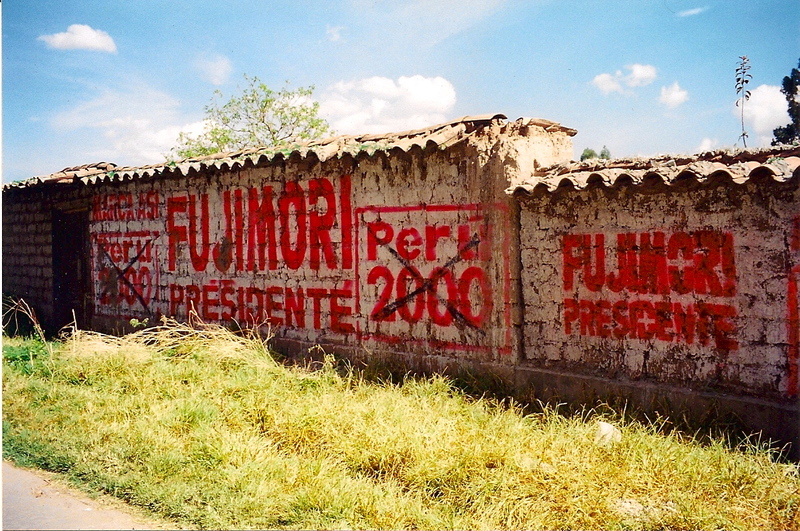 There is something so incredibly evocative about the Peru 2000 graffiti, especially given the story of Fujimori. That man had brass balls of denial. This was one of the coolest graffiti I have ever seen. Seeing that stuff in Peru in these isolated Andean villages and highways was really fascinating. I have a whole slough of graffiti photos from the 2000 elections there. Great post. 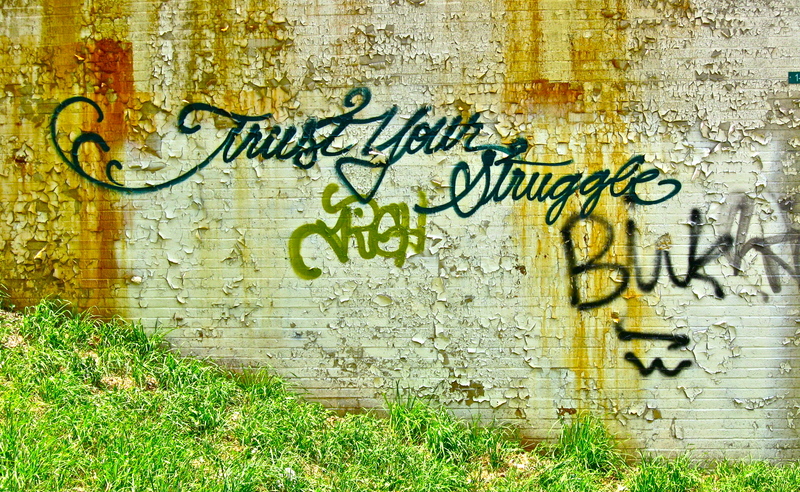 May I use your Trust Your Struggle image in one of my posts? I love to find beautiful graffitti, words of wisdom in the strangest of places. That said, I am honored to have one of my photos used by someone! It almost makes up for the fact that your first question is the reason why I’m not going to be able to sleep tonight. Because now that you mention it, how many words is a picture of words worth anyway? ps. I’m guessing it’s a “he”. As a holder of a PhD working in health-related concerns, I feel it is my professional and moral obligation help you understand the dangers of your neurosis. At issue here is projection. You don’t want to sleep. in which p is a picture of words and n is the number words in the picture. The real question here is why don’t you want to sleep? What are you trying to escape from? Second, the word game perpetrated on private property by this Portuguese hooligan is a test of will. Those that seek the truth see through the joke and are stronger for it, even if they need to have some Ex-Lax handy (and at least’s it chocolate-flavored). The real question here is why don’t you want to know the truth? What are you trying to escape from? 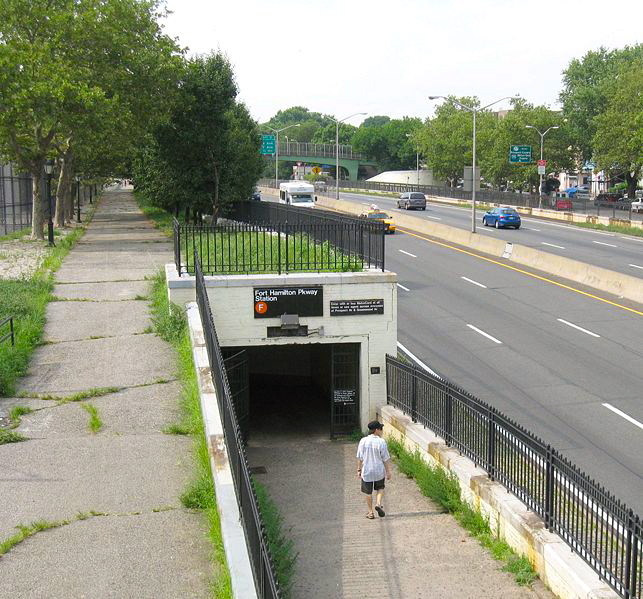 Third, and lastly, B you are obviously projecting a raw male sexuality onto the distant photo of a person walking into the Fort Hamilton Station, but nothing else is to be expected from a sleep-deprived woman hiding from the truth in order to avoid dealing with irritable bowel syndrome. What are you trying to escape from? In conclusion, B, as your friend, as a fellow blogger, and as an important health official, I beg you to seek help soon. In the interim, there a number of appropriate pharmaceutical interventions, some of which are even legal, that I could recommend if it were not for the restraining order and my parole regulations. But that’s another story for another day. Cheers and good luck at napping today. 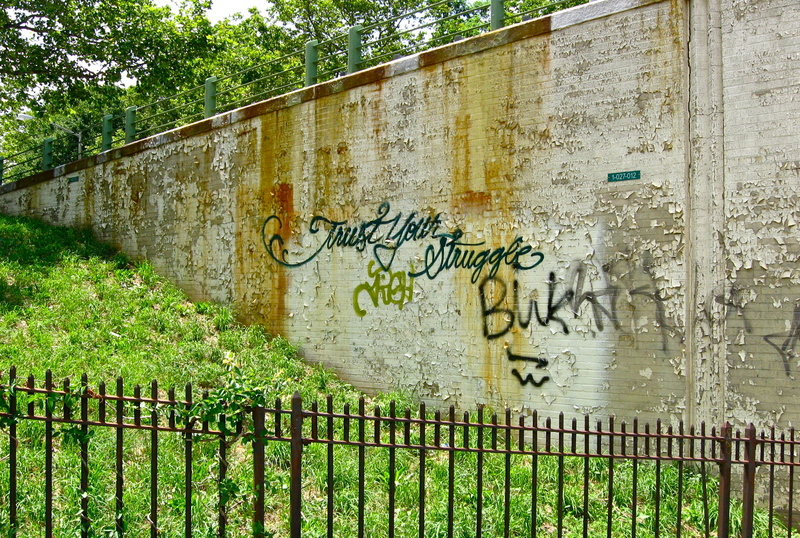 “Trust your struggle”—this really moves me, and I don’t know why. Maybe you can help explain, John? The saying on that wall speaks to me like this: Life is always a struggle. We are always striving, trying to accomplish something, fighting to make a living, to overcome a challenge, beat back a prejudice, build something worthy of the future, give expression to an inner life. Life is hard, but that’s not a bad thing. 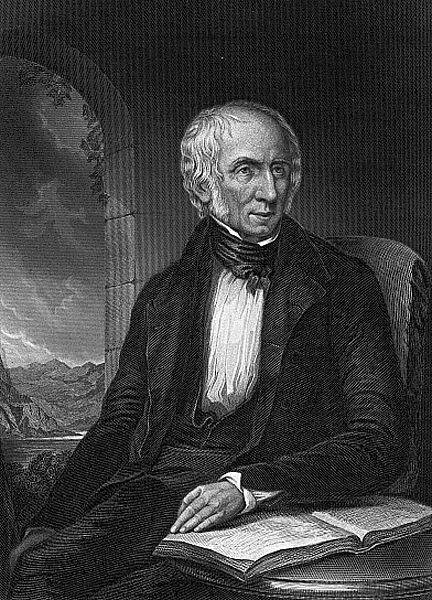 Rather than searching for happiness or contentment (especially conceived as entitlement, which seems to be the American way), one should trust the struggle. Look at your struggle, ask what are you struggling for? Choose your struggle. Shape your struggle. The struggle will define you either way, so take control of what you have in front of you. Surrender to the now and trust your struggle. It’s a leap of faith in which everything is essentially its opposite. Surrender is the road to freedom, and struggle is the path of happiness. Whether you achieve your goals completely or not, you stand a chance of being fulfilled with your life and actions, the content of your deeds and character, able to look back without regrets or a sense of opportunity lost. That’s why I took the photograph and decided to write about it. Hope you’re well.